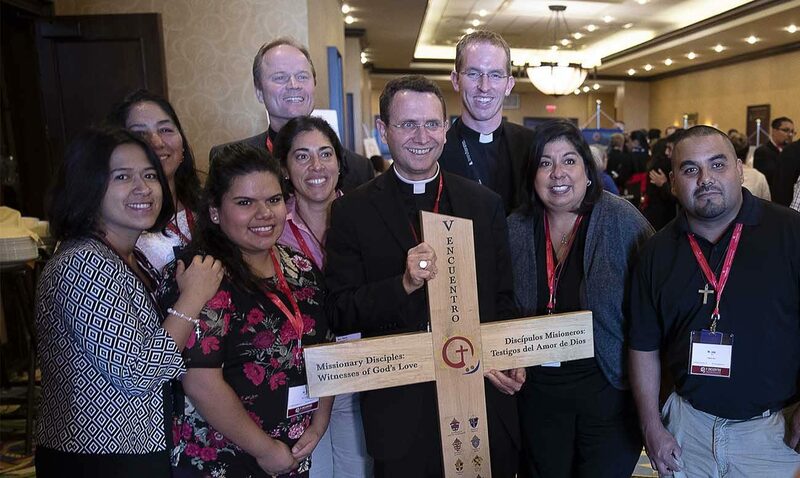 With hearts full of excitement and joy, about 3,000 Hispanic ministry leaders cheered as they welcomed representatives for each of the 14 episcopal regions approaching the stage and carrying the same crosses and colorful banners that accompanied their gatherings during the multiyear process of discernment and consultation that began at their parishes. The crosses were placed on the stage by the bishops who served as chairs for each region. In 1977, the second Encuentro also was held in Washington with the theme of “Pueblo the Dios en Marcha” (“People of God Going Forward”). Bishop Michael F. Olson of Fort Worth welcomed the participants, including international guests such as Archbishop Christophe Pierre; Guzman Carriquiry, secretary of the Pontifical Commission for Latin America; and bishop-representatives from the Latin American bishops’ council, or CELAM, as well as from Canada, El Salvador and Mexico.